[Martin Melchior] wanted to use an older Sigma lens with his Canon camera. The problem in trying to do so is that the camera uses a different communications protocol than the lens is expecting. But if you don’t mind cracking it open and doing a little microcontroller work you’ll be using the lens in no time. The hack uses an ATtiny24 chip, two resistors, and a capacitor. You won’t need to do any coding, but you do need to burn the firmware to the chip (you can use an Arduino if you don’t have a proper AVR programmer). There’s plenty of room for the add-on hardware inside the lens so after reassembling the enclosure you won’t even be able to tell that the unit was altered. 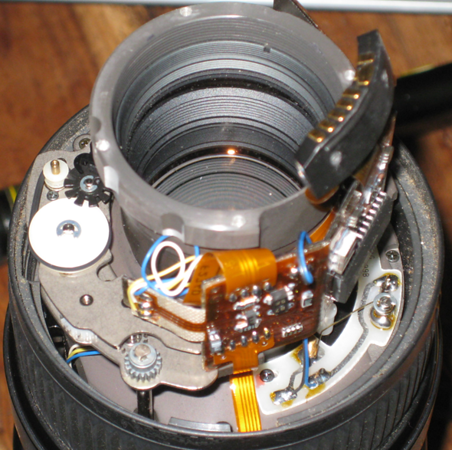 Unfortunately it doesn’t look like [Martin] took any pictures of the lens with his added electronics, but the schematic he posted should be enough for you to get the job done yourself. If you’re into these types of DSLR hacks you should try something extreme, like using view camera parts with your modern camera. Nice work, I have a old sigma lying around which only shoots fully open because of the incompatibility problem with the EOS digital bodies. I was just looking for something similar to this, except a full lens “emulator” chip rather than a mediator between the lens and a body. This enables focus confirmation to work on Canon EOS bodies when using old (non-electric) manual lenses by making it look like an EOS lens in manual focus mode is attached. Ebay sells a ton of these, but most of them are set to a fixed focal length / aperture and cannot be reprogrammed. Unfortunately it looks like no one has implemented the EOS protocol for AVR yet, but it has apparently been reverse-engineered. Nicely done, but whoa, that’s a ton of work for some relatively mediocre glass. …and mediocre glass is also overstated. The Sigma EX series have some very nice lenses, they’re a good value (not all of us are on a unlimited budget! ), and they have some lenses in their range that other companies don’t have. maybe some revisions have dual protocol support?